Jersey Culture – in painfully safe hands…as always. 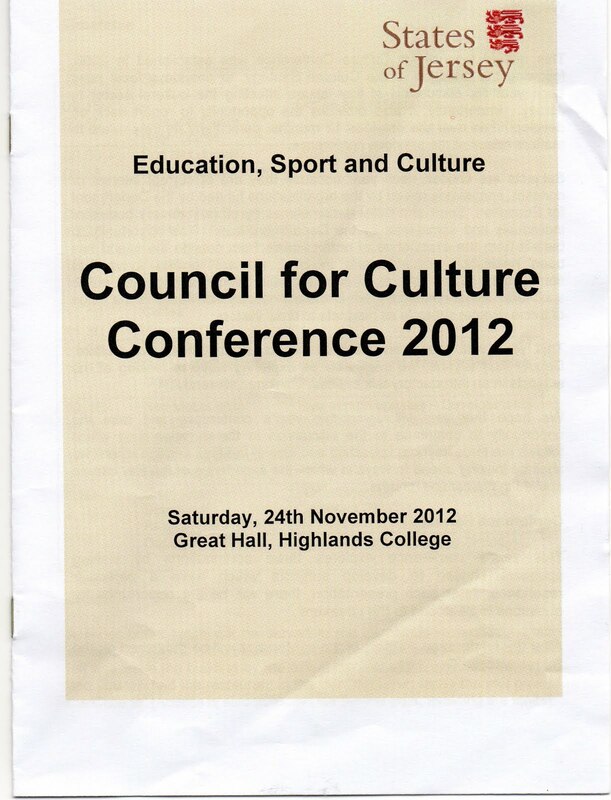 About 80 people attended the Council for Culture Conference (2012), organised by the States’ Education, Sport and Culture (ESC) Department taking place on Saturday 24 November at Highlands College. It has been an annual event since 2008. Rod McLoughlin as “Cultural Development Officer” introduced the proceedings whilst Deputy Rod Bryans as Assistant Minister for Culture & Youth Affairs was tasked to make the initial presentation with the theme “Thinking Differently”. Yours truly had turned up with my video camera hoping to record some keynote words and images to post here but was refused permission thus revealing in very quick time the same old culture of secrecy that we Jersey bloggers have come to know so well. A quasi-appeal to a friendly but sometimes prickly St Saviour Deputy could not change their collective minds although, so it transpired, an audio recording was being made of the entire conference…who for I wondered? Why he had made these remarks (or the introduction) was not at all clear but Deputy Bryans assured the audience that there would be ample time for questions later. Evidently chronicling did not yet mean video recording in his view of life and the universe. He even offered his own pet acronym “ACE” but the “C” did not alas stand for credibility. His own use of blog sites (including that for the Parish of St Helier) and love of “deep” Google searching was soon revealed along with his photographic, drawing and design interests. 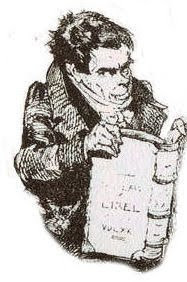 His credibility was further tarnished because Assistant Culture Minister Deputy Bryans, had, a few days previously, voted in the States against Deputy Pitman’s Proposition to acknowledge “Jersey Reform Day” and the revolutionary role of the same Tom Gruchy et al previously mentioned, back in 1769. 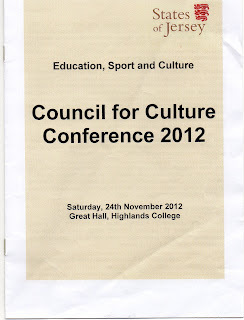 That proposition included a similar joining together of social, historical and cultural events that were being discussed at this conference. It was an extraordinary display of hypocrisy (even for a politician) to vote against a proposition on Tuesday only to be singing the praises of remarkably similar aims and objectives on Saturday! Of course he was not the only one. There were several other States’ members present who had rejected Jersey Reform Day and its supporting clauses promoting the arts, or research and recording of important Jersey historic events - yet were now here to applaud the pursuit of such projects in other far away places. The theme of the Conference was along the lines of “the capacity of culture to draw in people” – which was PR speak for attracting tourists. With Jersey’s coffers heading for half-empty this was a thinly disguised attempt at finding something lucrative to fill the already visible black hole. Next to enter the Conference Dragon's Den was a journalist turned book fancier from Wigtown in Scotland. This little town of 900 residents took a severe knock when the distillery (employing 200) closed overnight and the railway service was withdrawn. The solution here was to follow the trail blazed at Hay-On-Wye and about 250 other places in the UK namely to become a “book festival town”. Over a ten years period the fortunes of this little place have been reversed. But the speaker had some warnings to deliver about bursting bubbles, mergers in the book trade and how only the fittest festivals will survive etc. and festivals are by their nature “lazy events” which don’t actually, in themselves, generate much money. A plain speaking archaeologist from Orkney was the final UK participant. In her archipelago of 18 islands the Neolithic ancestors had been turned into a lucrative business where the fishing industry was all but dead and farming had been the mainstay until electricity generating windmills came along. Now so much electricity was being produced that the cables became overheated and farmers (in receipt of a payment for each unit) had to boil water just to dissipate it. The big attraction here for conference delegates was the possible status of “World Heritage Site” for Channel Islands’ fortifications. This carried the sound of serious earnings but “how mixed up in bureaucracy do you want to get” asked the speaker rhetorically. Her experiences on Orkney (with the status already granted for its Neolithic archaeology) should have been sufficient to deter most delegates. But the lure of diverse tourist business from day and short term trippers, visiting cruise ships (36,000 people per annum who spend very little in fact), an archaeology university, wreck diving, obscene graffiti left by Vikings, Italian wall paintings left by WW II POWs etc means that 25% of visitors came to Orkney for the archaeology whereas only 1% go to the Highlands for a similar reason. Clearly, long dead ancestors can lead to big business if properly managed and marketed. Tom Gruchy and his revolutionary supporters from 1769 are of course still politically sensitive in Jersey. Whereas a hologram portrait of the Queen, a model of the States’ mace or the relative heights of the Bailiff’s and Lt Governor’s chairs in the States are seen as safe and respectable cultural images. Significantly, delegates at these annual “cultural” conferences have a mindset that favours such international obligations as the World Heritage or Ramsar Conventions because they fit in with the preservationist, conservative dream. These are also evidently viewed as tools in the promotion of Jersey’s “cultural diplomacy” and the creeping “international identity” when dealing with “foreign” matters. On the other hand, such obligations as those included in the UN Covenant on Economic, Social and Cultural Rights (ESCR) are not so readily embraced. In fact, they are seldom if ever discussed at these conferences not least because they already impose a wide range of obligations on the Jersey government to take specific actions and comply with minimum standards of provision. Thus, ESCR is a very extensive Covenant with obligations that extend through education, social welfare, housing, health, employment, leisure and culture and much, much more. It has of course been ratified by and for Jersey but the public is hardly aware of its existence or importance. The question time promised at the outset never did materialise of course so yours truly was not able to challenge Deputy Rod Bryans on these and related issues – not least why did he vote against the recognition of Jersey Reform Day and the means to celebrate it?